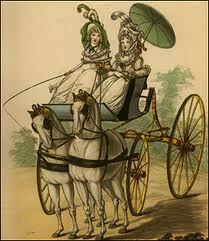 There were all kinds of carriages, suitable for a variety of purposes, during the Regency period. In Persuasion, Anne Elliott pointed out to Captain Benwick that she believed they were living in a great age for poetry. I feel the same way about the movies made within the last twenty years on Regency subjects. Particularly their display of horses and carriages. Willoughby drives Marianne in a phaeton (Sense and Sensibility, 1995), Sir Walter Elliott enters a town coach as he leaves Kellynch Hall (Persuasion, 1997), and Miss Elizabeth Bennett changes from her cousin’s gig to the public post-chaise, a large conveyance for regional travel (Pride and Prejudice, 1995). Which she prefers to Lady DeBurgh’s barouche! In Notorious Vow, Vivien is impressed by the earl of Northam’s customized tilbury, a light, fast, two-wheeled carriage normally designed for one horse, but which he had modified to be pulled by a pair of “sweet-goers” bred at Wimberley. The image to the right is a phaeton driven by an intrepid female driver. Read Heyer’s Regency Buck for an even more intrepid heroine who dares to drive her own racing curricle in a wagered race to Brighton that nearly lands her in the basket. Her guardian, the Earl of Worth, has to employ his own record-setting team to catch her. Strong words indeed from a man to a woman whose wardship he never sought nor desired. And small wonder it resulted in an unforgettable tension between two people hopelessly in love. This entry was posted in Notorious Vow, Regency and tagged tilbury post chaise high perch phaeton by Angelyn. Bookmark the permalink. Love it! Who would have thought there were so many kinds of carriages………like car types today! Great blurb, Angelyn! I might have to check the novel you mentioned – I can only hope it’s written as well as you paraphrase. Thank you for the compliment! Heyer’s novel describes a Regency that I venture to say would be unrecognizable to newer readers of the genre. English society at that time was obsessed with social status and keeping boundaries between the classes as rigid as possible. Newer novels in this genre do not emphasize this critical element as much. However written, though, a Regency novel never fails to generate my interest as a reader!